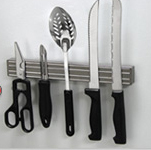 Powerful magnetic bars in attractive flat black organize utensils and tools in the kitchen, shop or home office. Two mounting styles to choose from. 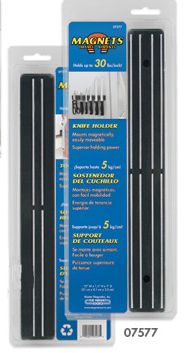 Magnetic mount features magnets on front and back so bar attracts to metal surface for mounting. Screw mount features one-sided magnetism with mounting screws included. 30 lbs. pull per inch. 12” W x 1.5” H x 1” D.